Although 2013/14 hockey products are already on store shelves, the just released Panini Prime is actually a 2012/13 product. 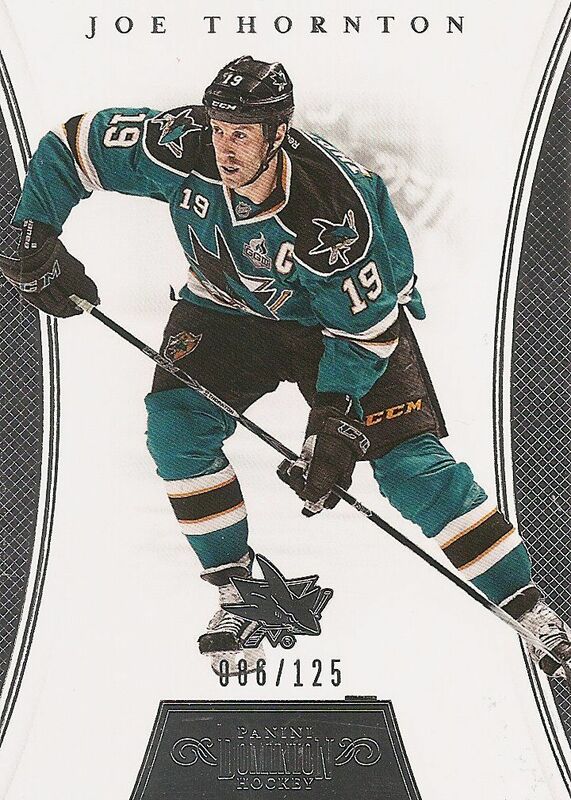 In fact, it's the last hockey product of that abbreviated hockey card year. Panini has been leaking previews and making collectors salivate with anticipation for weeks. But Prime is now here, and it's brining some Dominion along with it! It'a a product that many have been looking forward to. Let's take a look at what it brings to the table! The Prime base cards have a simplified look compared to it's inaugural debut. Each prime base card is numbered to just /249 and is on heavy-premium stock. To me, the base cards now carry a more mature look. It's probably the fade-to-pitch-black thing they have going on at the bottom portion of the card. It makes for a very stark look. The all-caps gold font used for the team and player name is strong and bold. I do think that this darkened space takes up a bit too much room on the card though. It's a good third of the entire front! If it were up to me, I would have lowered the area to meet either the serial numbering or the top of the team name. As they are, the dark area makes it look like part of the player photo is hidden. On a more positive note, the smokey background is back and looks very nice. It's definitely part of creating that mature look that I talked about at the beginning. It's a design that I think higher-end collectors would appreciate and enjoy. The backs of the Prime base cards are intriguing to me. 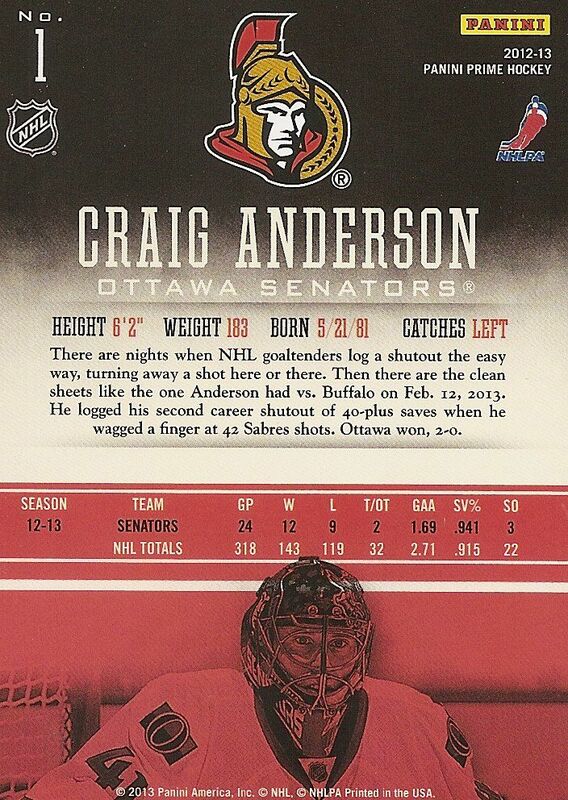 Usually, player photos are located toward the top of the card; here, it's at the bottom and incorporated with the player stats. It's definitely a different look. Also different is the choice to make the photograph monotoned. All this contributes to a very unique looking card back. I've complained a bit in recent about bland Panini hockey card backs. I can say that these Prime backs don't have that problem. Panini has done good with these. I prefer these backsides to the front! 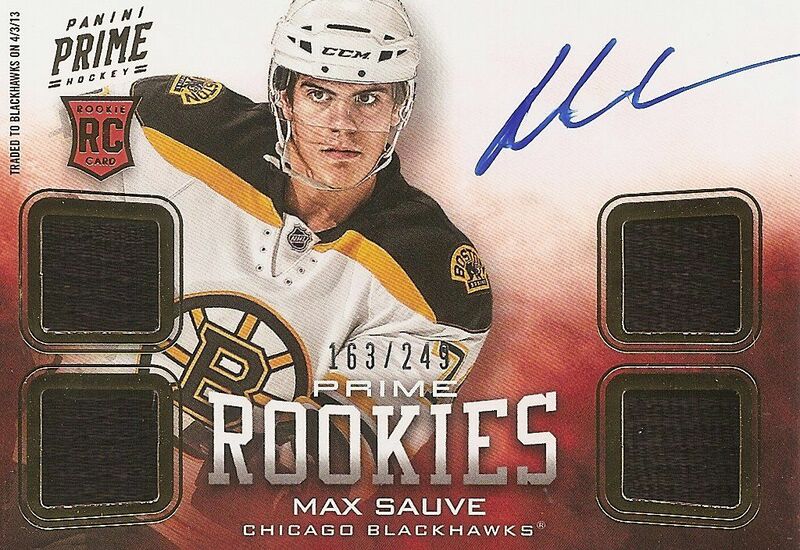 The rookie cards in Prime come at the back-end of the regular base set. Each rookie card features an on-card autograph and four memorabilia pieces. Standard rookie cards are numbered to /249, but more limited versions with premium pieces like prime jerseys, patches, and fight straps are available too. The rookie cards this year have a very pleasing look. It was a great idea to separate the four memorabilia pieces into two per side. The spacing is just right, and it's nice to have the player photo in a more central location. The Prime Rookies logo has been done in a way that creates a stretching effect that I think gives the card a movement-type quality. These cards are an improvement from last year. They look great! Each pack of Prime only comes with 5 cards, but... Panini has given collectors a nice bonus in the form of a 2 card pack of Dominion. Panini has loaded up Prime a huge variety of jersey, prime jersey, patch, skate, glove, ties, and helmet cards. It was pretty incredible seeing the previews of what can actually come out of Prime boxes. Common to Prime this year are the multi-jersey die-cut cards. These types of cards feature one or more players on them with a word filled in with memorabilia pieces. Panini has done a pretty good job of finding unique and fun combinations of players to group together. While the concept is a good one, I find that these cards have been done a bit too often. They don't garner as much attention as they would have a few years ago. Also, while the jersey swatch cut-outs give you a clue to the relationship between the players, it would have been nice to include a write-up on the back to further clarify that relationship. The backs simply have a guarantee from Panini that the swatches were player-worn. The better the memorabilia inside, the lower the print-run. 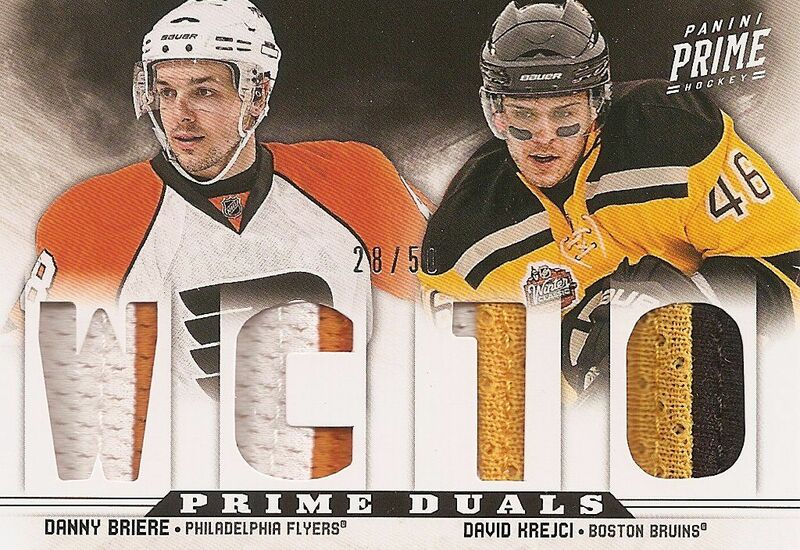 Here's a Prime Duals with prime jersey pieces of Danny Briere and David Krejci numbered to just /50. The memorabilia pieces with thick seams and multiple colors look great and really help to set off this card. The patch version of these cards halves the print-run again to /25. Patch pieces can look even better than these... provided they are not of the one-color variety. Prime Signature cards have made their way again in to Prime. These cards have gone horizontal. Unlike what I thought of the base cards, these ones went from a more stoic tone to a faster one. The tilted lines that grace these cards give these cards a fast feel. It's a nice change that reflects the speedy nature of hockey. Last year I pulled cards with faded blue ink... and the Cizikas above appears to have some of those same issues. Hopefully it's not a wide-spread problem. Dominion packs typically will give you one base card and a Dominion hit. Lucky collectors might get a short printed base card. This year's Dominion base are very reminiscent of the 11/12 cards. In fact, when I saw them I thought Panini had actually recycled the same design. While it is similar, it's actually not. The foil edges on these Dominion base cards form inward facing slopes. Last year's foil was in the shape of a wide dip.... so... this year's and last years are basically the reverse of each other. Slight changes in the Dominion logo at the bottom are also difference indicators. The base cards are very thick, as a super-premium card should be. I felt that this Prime box was below average for a break. Luckily, I did get the Stickside Signatures card above to help boost it up a little. If this card looks familiar, it is. It's actually a holdover card that didn't make it into last year's Dominion release. It's a gorgeous card with a crazy looking piece of stick. The autograph is a bit difficult to see but it's there in gold ink. This card doesn't make the break a good one, but it softens the blow of this soft Prime box. Aside from the Dominion Stickside Signatures, this particular box of Prime didn't have anything too impressive. I have watched many, many breaks in 12/13 Prime in the past couple days and have seen some very sweet, nasty cards come out. You'll just have to take my word that there are amazing Prime cards out there to be had. 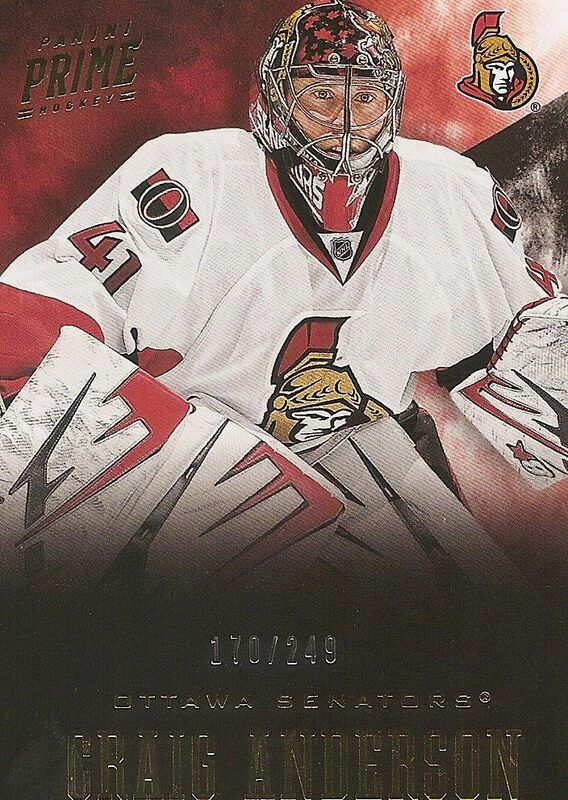 Panini Prime is a great way to end the 12/13 hockey product season. There is a ton of amazing memorabilia that will blow your mind that can come out of it. To get a better read on Prime, I'd suggest going on Youtube or looking on the hockey card forums and seeing the breaks that are posted. They are definitely worth a look. Prime is pricey for only seven cards, but they that's the nature of very high-end products like this. For those who have the money, this is probably the best you can do in terms of a 12/13 hockey card. I'm sure the high-rollers out there are already diving deep into it. I do have to say though, that as much of Prime that I've seen, I've noticed that the real big named stars come few and far between. Stars like Crosby, Ovechkin, Stamkos... they are not easy finds. So while you may get some crazy, crazy looking patches... it may be of a more minor star or fan-favorite. Is that something you've noticed? I'd be very interested to hear your thoughts on that. But in any case, Prime is still the best and most premium card release for 12/13 hockey. Did Panini improve over last year's product? I'd say yes! Prime is a very fun rip. If you can do it... DO IT! IMO this was a sub-par box of the stuff. Had the standard cards, but nothing wowed me. I really wanted 12-13 Prime to be the end it all products for the year. With all the lovely patches of superstars that Panini posted before the break, everyone thought this would blow out all other products and potential be the product of the year. I agree that there are spectacular patches but the serious lack of superstars appearing is hurting the product. I did my own personal box and while I did hit a low numbered card, it was of a lesser known star (Bobby Ryan. I personally find that the Prime pack itself is weak if you do not hit a prime colours or even a decent superstar card. The Dominion pack seems to be the saving grace of most breaks I have seen so far. Keep up the good work! I have been a follower/reader but this is my first time commenting! I always look forward to your posts! Prime looks sick, and I think it's pretty cool that they have a dominion pack in the box as well. And honestly I think the Dominion pack was better then the prime,,,dominion pack recovered for the weak prime pack. Prime looks like its back and better than ever! It's a little out of my price range, but I will definitely try to pick up some singles. The patches are amazing, hence the name of the product, and the added Dominion box-topper adds a good amount of value. Overall, I think Prime looks awesome, and has a great amount of value for group breakers and box busters. really like that they threw in dominion packs and also great review luke. I feel that if the prime pack is poor then on the production run the dominion pack is strong to balance it out. 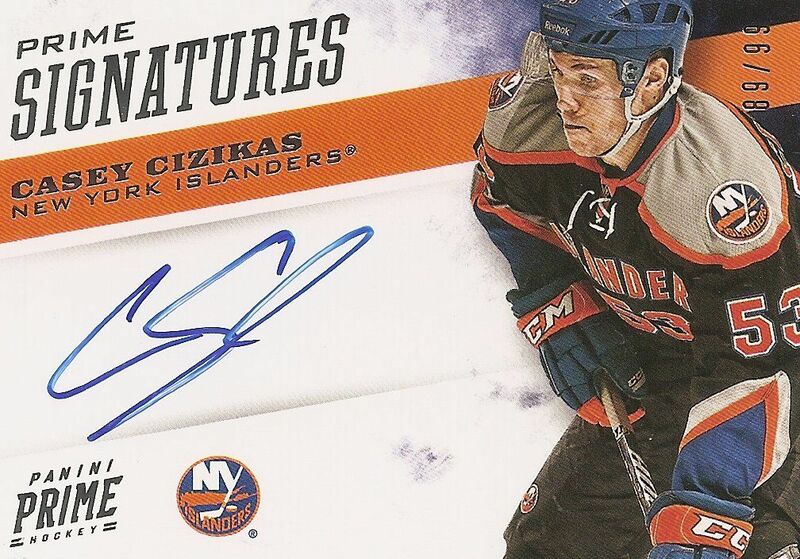 Because that is a very nice stickside signatures card. wow panini looks really good this year gonna try to get a box. I think a good product is something that leaves you feeling like you got your money's worth. Your prime box was horrible. The dominion pack is a guaranteed patch auto or better, so that should make the buyer feeling some comfort. Also the patches in this product make up for the lack of star player autographs. I couldn't believe your prime box didn't have a stand out card. Last year's Prime and this year's Prime are about similar. Nothing stands out this year for me. The rookies are worse, that's it. I really like that extra dominion pack inside box! Great that you get a hit in every dominion pack! Prime duals patches looks also sick and i relly like those spelling's on those cards like WC10 & YOTE & COLD and many more cool! Prime rookies look weird! I mean swatches are good but place for autgraph is not that good! Prime colours looks sick especially when you get huge chunks! I think for that price category this product is great and way better thata the cup! I feel for the price its a huge hit or miss. Either you go big or you get a very sub-par box but every break i've seen looks like a lot of fun. Plus with this break you hit a pc player of mine. great product wish i could buy it but the designs are sick. nice stick luke second one. Really great product this year! Panini has made Prime look better and designed this years product better than last years! I think that the design of prime is amazing, but I also think that the downside of it is that its pretty hard to get your money back, 25 percent of the time you do good and 75 percent you do not so good. The dominion pack is what saves most breaks. The only thing i find they really improved on this year was card design. Especially the jersey cards. Last years looked clunky to me. Very good product even if i dint get any thing good.Panini really took the step in the right direction.Looking forward to next years prime. Prime does look like a better product than last years because of the dominion pack to always give you a nice card. The shannahan looks SICK!! I really like prime this year. If I had the money I would definitely buy a box of it. I really like how the base cards look this year and I think that including the dominion pack makes this that much more fun of a break. High risk, high reward. Great work Panini! PRIME is really nice this year. I have to agree that it does look better than last years and that the patches in this product are so amazing. Chris pulled 3 of the most nastiest patches and all prime colors. Really like prime this. Dominion is nice looking too. I'm actually about to place an order and I'm trying to decide between Prime or Trilogy. I think I'm leaning towards Trilogy; its about $10 cheaper, there's more to bust, rookies, plus I always tend to go with Panini products and I want to try something from UD. Might wait and see on Prime. Looks great! It's a great product and that stick side signature of Shanny looks sweet! The shannahan is amazing, otherwise it was sort of a miss. I have seen some pretty sweet stuff come out of it so far. too hit/miss for me. Great review!!! I think that this is definitely worth the money. This stuff keeps pumping it out watched tons of cases Shields,Skates,Sick Patches you name it Love this Stuff!!! Easily the best Hockey Product Panini has out on the market. I really thought it was going to be impossible to beat 11-12 Prime but aside from your box lol they have. Just kidding. Love this product, yes the price tag is high for some collectors but for those who can afford it, it is worth every cent. Every card is well designed and amazing even the base cards. I agree with HockeyCardBreaks that this product should have been the last of the year with it's amazing patches and short printed cards but also why wait for something so good! Thanks for the contest man! I really enjoy prime! I think it is a great designed set! I like how they went slightly darker with the look of the set! Thanks so much for all your contests! Actually..I have to say I'm a bit disappointed of Prime. Maybe all the sneak peeks and previews from Panini made the expectations too high. Because now, when the product is released, I think it's not that loaded as I first though. Sure you CAN still found those crazy patches and other nice stuff, but; in a pack you can also get 5 players who is far away from the top names in the NHL. And the 12-13 Rookie Class is very bad as well, and when even the etablished names doesn't appear that often it's very risky since you can be left out with a bad box at a high price Point. Prime is top notch! Panini steps it up again. Also an amazing review Luke! Prime looks beautiful this year! I feel that the Dominion bonus pack gives this product its value with the rookie crop being only mediocre. However, with the price point of this product I don`t think I`ll be able to break any of this lol. 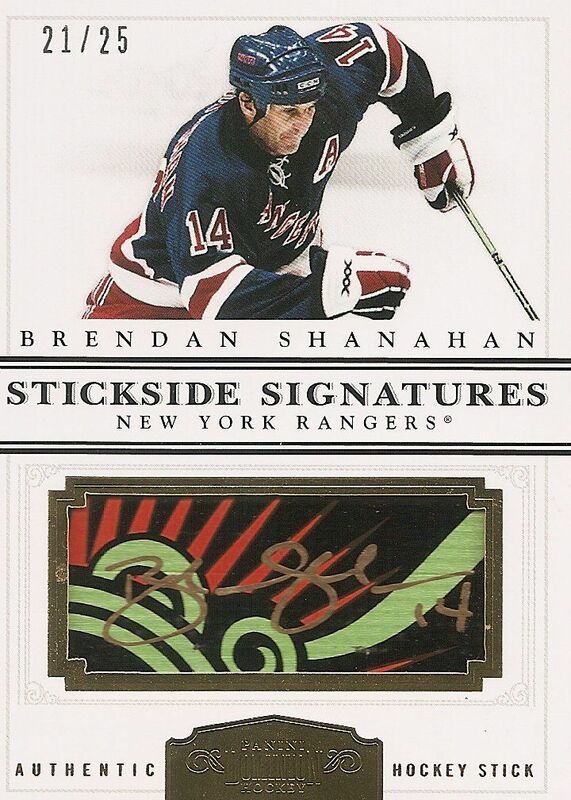 That Stickside Signatures is definitely a sweet looking card as well with the gold signature on the multi-coloured stick. Thanks Luke for the entertaining videos, informative reviews, and contests! Prime is easily one of the sickest products of the year. 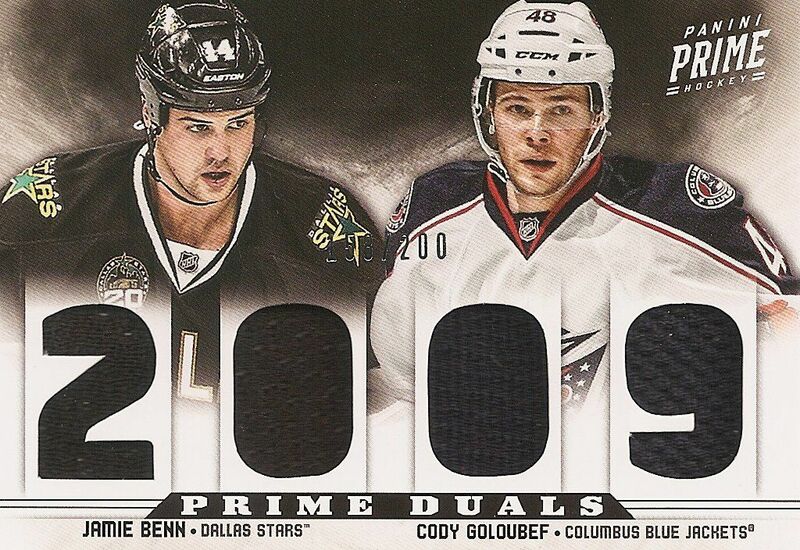 All the multi colour patches and all the solid hits, prime is the nicest product of the year. i think this prime is better than last with all the sick hits that u can pull and the bonus pack! Prime this year is a huge hit or miss. I seen breaks that have been amazing, then boxes that will hurt me to see opened. prime color logos look really good, but Panini put some players in this high end product that kind of makes me scratched my head. Great review Luke! !